Jeremy Corbyn would probably be the first to admit that he didn't have a lot of choice when it came to appointing a new Shadow Secretary of State for Wales, what with all the 'moderate' knives in his 'lefty' back. But his choice of Cardiff Central's Jo Stevens is really scraping the barrel. 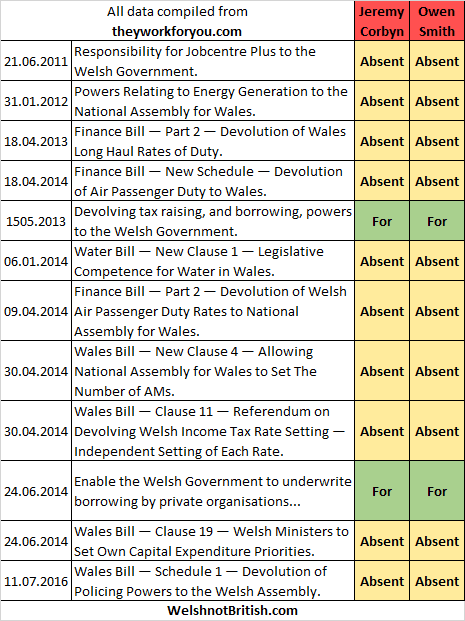 We know Jeremy Corbyn couldn't give a toss about Wales, his voting record proves this. But what about Jo? Off I went to They Work For You to see what her records are like on the subject of Wales. And do you know what it says? In bold type at the top of the page it says "Jo Stevens has never voted on transferring more powers to the Welsh Assembly". 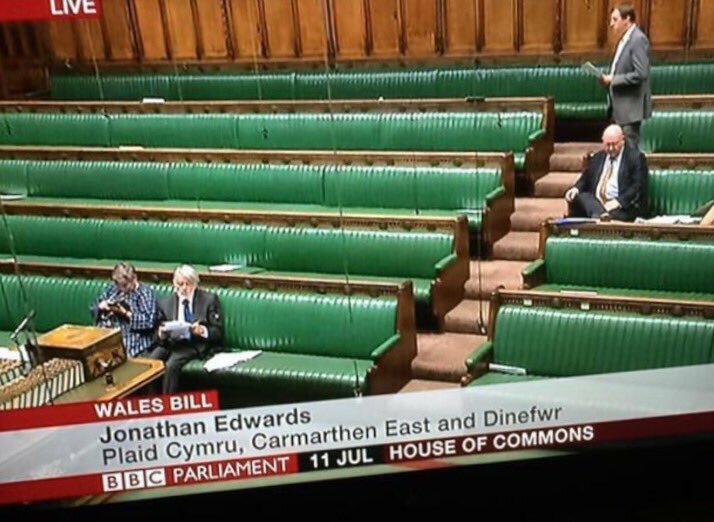 Newport West MP Paul Flynn isn't happy with a recent photo of empty Labour benches during a debate on Wales on July 11th. It's worthwhile mentioning the July 11th date again just so that people are quite aware of the date, which as you should know by now was July 11th. 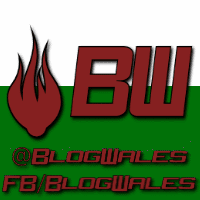 Photo from Hywel William, original tweet. Take me to your leader - 2016 edition. Back when Labour held their leadership election last year I ran a comparison of the four horsepeople of the apocalypse that were standing. As a lot of Labour MPs clearly didn't like the results of last years contest, and because it's quite easy to do, here's the updated version featuring this years entrants. There are no shocks contained within this image. 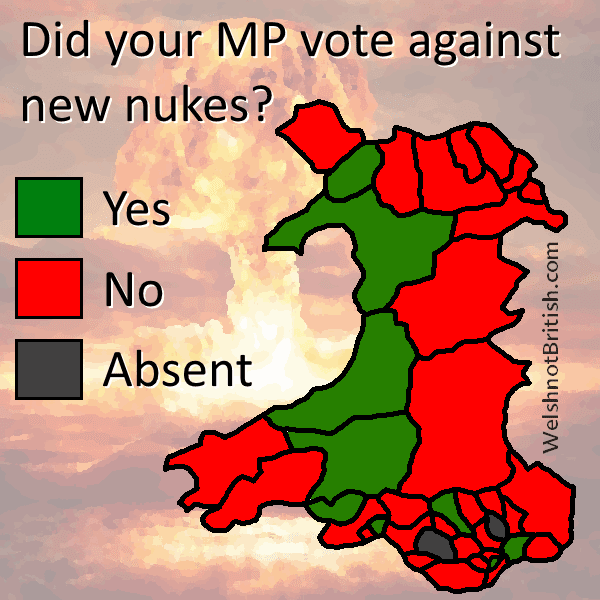 Did your MP vote against new nukes? The latest figure on renewing the UK's nuclear weapons stands at between £167 billion (MoD) and £205 billion (CnD) depending on whose figures you believe. Both eye watering amounts are calculated on the initial cost plus 30 years worth of upkeep. New Prime Minister Theresa May opted to call a vote on renewing the nukes, presumably in order to piss off Scotland a bit more and as an easy way of causing further division amongst Labour. But enough about that, let's get on with showing who voted to spend billions of pounds on weapons of mass destruction and who didn't. Wouldn't you prefer a good game of chess? The Red Tories down in Cardiff West apparently haven't quite gotten over Neil McEvoy giving Mark Drakeford a fright in the constituency election before getting elected on the list. 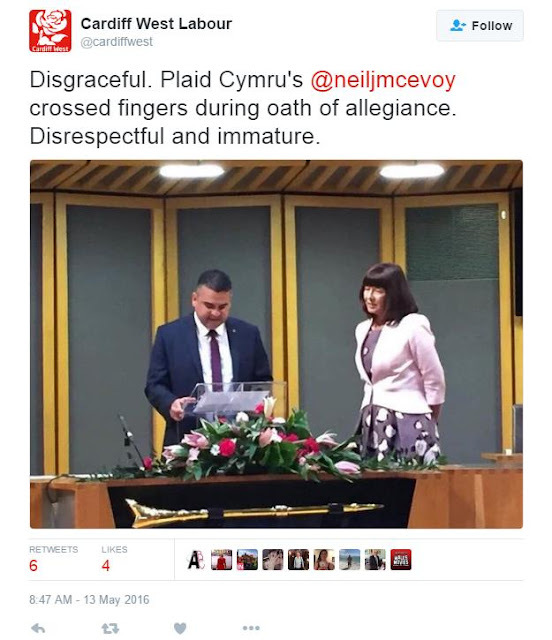 Before an AM is allowed to take up their role in the Senedd they have to bend the knee and crawl on the ground like a worm and swear fealty to the English queen, Betty Battenberg. Like so many others before him, Neil chose to cross his fingers as a sign that he was begrudgingly repeating some words in order to represent the people who elected him. This is where Labour's faux-outrage and hypocrisy comes in.